By buying this product you can collect up to 17 points. Your cart will total 17 points that can be converted into a voucher of €0.17. 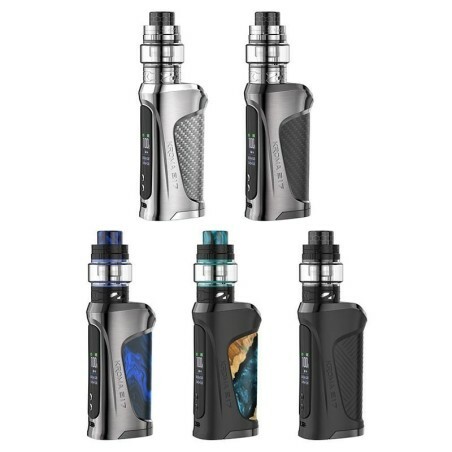 Joyetech eGo AIO Box Full Kit 2100 mah Complete Kit Color Black / Gray. The eGO AIO Box electronic cigarette represents the maximum evolution in terms of safety thanks to the special anti-opening structure and the double protection circuit. The eGO AIO Box will surprise you with its lightness, small size and high performance in terms of steam and vaping quality. It is an integrated Box with a 2100 mah long-life internal battery and a 2 ml atomizer with Air Inflow air flow control. . The atomizer has an anti-child safety system (Child Lock), to open it you must hold down while turning the part over. The atomizer is recharged from above and the airflow (AIr Flow) is adjusted via the upper rotating ring. The internal atomizer is fitted as standard with a 0.6 ohm BF SS316 steel resistance (it is the same mounted in the Cubis) that generates large quantities of steam and an octane aroma. The battery is recharged via the Micro USB cable. Created by the world leader in electronic cigarettes Joyetech, the eGo AIO Box is unmatched for the quality and reliability of its products. 2 atomizer heads BF SS 316-0.6ohm MTL. 4. Choice of the LED color of the tank, as well as the appearance of the box with the various backgrounds available. Charge the eGo AIO Box by connecting it to a computer or wall adapter with a USB cable. Once fully charged, the button light goes out.